Definition - The word 'halberd' is derived from the German words halm ( meaning staff), and barte (meaning axe). The Middle Ages was an extremely violent era in history featuring battles in both Europe and the Holy Land when the crusades, and the crusaders who fought them, were numerous. Feudal Lords and Knights used such weapons as the Halberd in different types of warfare. The quest for power led to invasions of lands and territories which had to be fought for. Siege warfare, waged to win a castle or a walled town or city, was a frequent occurrence during the Middle Ages. Warfare during the Middle Ages, or Medieval era called for a variety of weapon expertise. Knights and men-at-arms ( foot soldiers, or archers ) used different types of weapons. 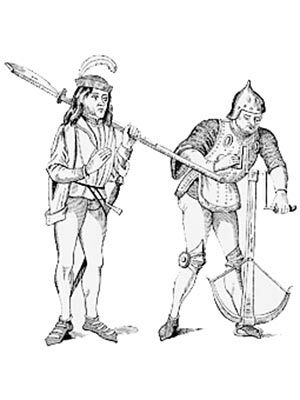 The Halberd was predominantly used by a Foot Soldiers. The weapons used were dictated according to status and position. The weapons, armor and horse of the Knight were extremely expensive - the fighting power of just one knight was worth 10 ordinary soldiers. Langets were added to strengthen this type of weapon. These were metal strips riveted to the the shaft of polearms to reinforce the torque against the head, and to provide protection to the potentially weak point between the weapon-head and the shaft. Blacksmiths are usually associated with making weapons in a village smithy but blacksmiths were an important part of a fighting army, making new weapons and repairing and the maintenance of old weapons. Each section of Middle Ages Weapons provides interesting facts and information about Medieval warfare in addition to the Halberd. The Sitemap provides full details of all of the information and facts provided about the fascinating subject of the Medieval period of the Middle Ages!